Hi, I am interested in your 1961 Chevrolet Biscayne (stock #4784-CHA) listed on Autotrader for $19,995. I'd like to get more information about this vehicle and confirm its availability. 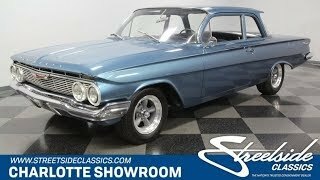 You probably were just attracted to this 1961 Chevrolet Biscayne because you though it looked cool and was priced right. Little did you know that this two-door has a powerful small block V8 and an upgraded five-speed stick-shift to maximize the fun. All the chrome in the front, curved windshield, wraparound rear glass, and a hint of an overhang on the roof this classic really has style. Its absolutely awesome how the stylized sheet metal in the profile have a design line that warps around the rear and creates the dipping V in the rear panel (an exclusive style element to the 61 Chevys.) Its all quite distinctive finished in a metallic blue-grey paint. But while all this is part of a great vintage package, the completion-style American Racing Torq Thrust wheels hint at the upgrades within. Inside is a highly correct interior that continues the sea of blue. The Biscayne offers plenty of full-size comfort to carry family and friends across two rows of wide benches, but the best treats are reserved just for the driver. You get the original stylized two-spoke steering wheel, which gives you a clear view of the artful factory gauges, as well as the added large tach. Plus, with a full auxiliary readouts and shifter sticking out of the floor, you know theres something special under the hood before you even twist the key and hear it growl. The bold orange block, shining ribbed valve covers, and matching air topper look like they are radiating power from within the dark engine bay. And that makes sense. This much younger Chevy 350 cubic-inch power plant was even larger than the big block Chevy offered in 1961. Plus, it has nice upgrades like an Edelbrock four-barrel carburetor and ZZ4 roller camshaft. It gives this one extra power and a great rumble out of the Flowmaster dual exhaust. You have enhanced control over this V8 and its thunderous soundtrack thanks to a more modern five-speed manual transmission. Heres a great classic body style with some great driving enhancements, and best of all, its offered for quite an obtainable price. So dont miss your chance, call today!